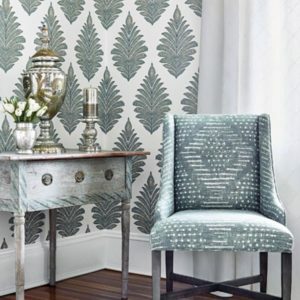 Repeating colors and patterns throughout a space is a surefire way of giving a sense of rhythm to a room or an entire home. Below you can see the sense of rhythm created by repetition of both color and pattern. Alternating elements is also a method of creating a sense of rhythm in a room. The shelves below are styled in a way that keeps your eye moving around the space in a way that satisfies a sense of anticipation for repeated colors and shapes. 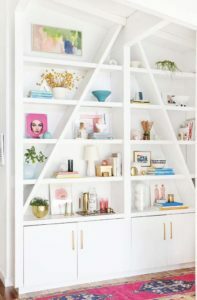 Pinks, golds, and blues are alternated to give the shelves a dynamic rhythm. Colors arranged in progression are another effective method for creating rhythm. The use of analogous colors or varying shades of the same color add interest to a space as well as cohesiveness. The warm palette in the bedroom below is a great example of this. 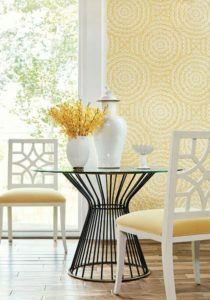 If you are looking to add some rhythm to your space, come see us at Columbia Paint or Clarksville Paint and Decorating Design Centers for one on one assistance. We have over 250 wallcovering books and nearly as many fabric books. We also carry rugs, window coverings, and everything you need to paint your space. Stay tuned for next week’s design principle feature; We will be providing more tips and tricks to DIY your interior design.